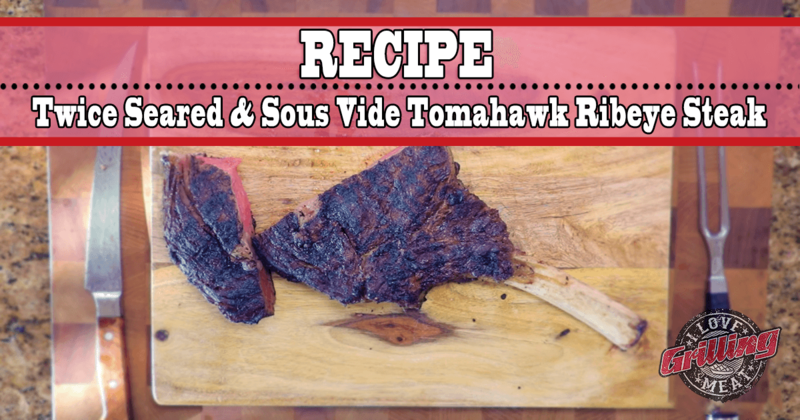 A great steak is all about crispy outer crust with a tender juicy inside… and this sous vide tomahawk steak will give you both. Searing it twice ensures all of the flavor gets sealed inside the meat so buckle up because this is going to be epic. All right, let’s get this party started! Once you have that juicy tomahawk steak in front of you, your first instinct might be to bite right into it… But wait! You’ve gotta season first. Use brown sugar and garlic powder (1 Tbsp each) mixed with black pepper (1/2 Tbsp), sea salt (1 Tbsp) and Cayenne pepper (1/2 tsp). Make sure to cover every surface on the steak. Place the steak in the fridge to cool down. You want the meat to be as cold as possible before searing it, as this will result in a killer crust! Time to get blazin’ hot around here… Fire up your grill to searing temperature (350-400 ºF) and sear each side for ~2 minutes. If you wanna get those hash marks you see on TV, rotate the steak by 45 degrees halfway through searing each side. When done, pull the steak from heat. Next up, controversial part… Yes, this is where you’ll sous-vide the steak. Place it in a large enough vacuum-ready bag, and add a chunk of butter for some “extra love”. Once you have the steak vacuum sealed, set up your Sous-Vide machine and run it at 123 degrees (medium-rare) for about 2 hours. When the sous-vide part is over, you can get the steak out of its jacuzzi, and out of the plastic bag. Pat it dry to remove as much moisture as you can. Have your grill ready for a second round of searing. Hit each side for about 90 seconds max. That’s it – you are now in possession of one of the tastiest, most juicy and tender steaks in existence!